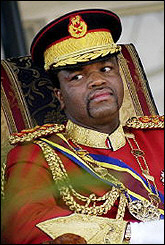 Exactly one year after creeping to South Africa, cap in hand, to seek a R2.4 Billion loan from that country, King Mswati is throwing himself a 45th birthday party whose overall expenditure exceeds R33 million. This figure has been kept from the public, who have been fed the lie that only R10 million has been set aside for royal celebrations this year. Not that R10 million is an insignificant figure for a poor nation which only a year ago could barely pay its civil servants, but the figure that inside sources have revealed is a shocking R33 million. The Swaziland Solidarity Network strongly condemns this grotesque waste of public funds and hopes that the country's sponsors will take note of exactly what they fund when they give away millions of rands to this narcissistic despot known as Mswati. Swazis should also stop fearing the batons and guns of security forces and stop this mad waste. This is a man who had at last count had 13 wives and 27 children the head of a chronically poor state with the highest aids infection rate in the world. It is basically a basket case relying on aid to keep afloat. When will Africa get rid of its wasteful and self indulging leaders?